Who would want to be a banker in UK at the moment? They are not particularly popular and I do feel sorry for the “normal” bank workers who must be fed up defending themselves against the accusations of greed. The workers who are not in line to receive a huge bonus, the ones who are on the front line. The actions of their superiors must make them cringe. And I have no doubt that they are the ones getting the abuse from irate customers when stories like this are aired. In August, 1m RBS customers with basic bank accounts were told they could withdraw money only from RBS, NatWest, Tesco or Morrison cash machines. The RBS move affects customers with basic accounts that do not offer overdrafts or chequebooks. They can also withdraw over the counter at Post Offices. The bank explained the change at the time by saying the cost of offering a wider range of ATMs – or cash machines – to basic bank account customers was now “unsustainable”. I note that it is Tesco and Morrison cash machines, not Sainsbury or Waitrose and am surprised they didn’t add Asda to the list. Who has a basic account, one without an overdraft or a chequebook? It is not the rich, that is for sure. Basic account holders are those who are already struggling, and must now go out of their way to take cash out. This means that instead of nipping to the ATM down the road, they have to drive to the next available cash point. If they have a car, and if they have petrol for the car. If not, well they will just have to walk. If they are able to walk that far. What infuriates me most is that many of these people will have been victims of the British banks’ strange money making scheme – the unauthorised overdraft charges. Perhaps this is even part of the reason that they are in debt. When I left home and got my first job in Scotland, I had a bank account with the Bank of Scotland. I was earning a very low wage, and had to watch my pennies carefully. If I went overdrawn by even just a small amount, the bank charged me £20. Which meant that the next month, I was overdrawn again and so was charged again. £20 is a lot of money when you only earn £500 a month. It is a vicious circle and the banks have been doing this for decades. The Bank of Scotland reported £2bn pre-tax profit for the 3rd quarter of 2011. Do they really expect us to believe that their recovery hinges on their customers with basic bank accounts being able to withdraw cash from all machines? 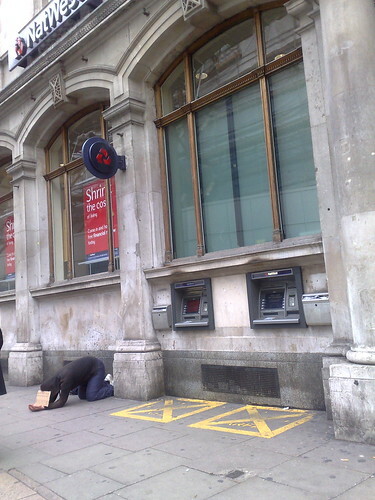 The banks should be ashamed of themselves. These basic bank accounts don’t have debit cards generally. So the account holders are forced to use cash – which they now can’t get easy access to. I wish RBS still charged just £20. Now it’s £6 A DAY. And if you’re waiting for your next wage to go in that could be a week or more away. That is awful, Stuart. How on earth can they justify that?